After posting the article “designing your vMotion network” I quickly received the question which failover order configuration is better. Is it better to configure the redundant NIC(s) as standby or as unused? The short answer: always use standby and never unused! In the scenario as depicted in the diagram I prefer to use active/unused. If you think about it the standby option does not give you anything as when one of the NICs fails both vmknics will be on the same NIC which does not give you anything. 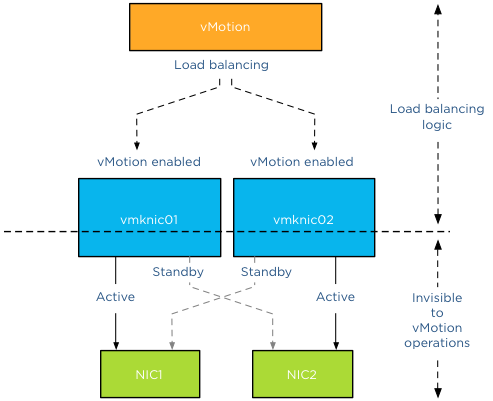 As mentioned in the previous article, vMotion operations are done at the vmknic level. Due to vMotion focussing on the vmknic layer instead of the physical layer, some details are abstracted from vMotion load balancing logic such as the physical NIC’s link state or health. Due to this abstraction vMotion just selects the appopriate vmknics for load balancing network packets and trusts that there is connectivity between the vmknics of the source and destination host. As such, if you’ve got multiple physical NICs on a host that you plan to use for vMotion traffic, it makes sense to mark them as standby NICs for the other vMotion vmknics on the host. That way, even if you lose a physical NIC, you won’t see vMotion network connectivity issues. By placing the redundant NICs into standby instead of unused you avoid the risk of having an unstable vMotion network. If a NIC fails, you might experience some vMotion performance degradation as the traffic gets routed through the same NIC, but you can trust your vMotion network to correclty migrate all virtual machines off the host in order for to replace the faulty NIC. By writing about the fact that vMotion designates a vmknic to be the default interface I’m aware that this triggers and sparks the interest of some of the creative minds in our community. Please do not attempt to figure out which vmknic is designated as default interface and make that specific vmknic redundant and different from the rest. To paraphrase Albert Einstein: “Simplicity is the root of all genius”. Keep your Multi-NIC consistent and identical within the host and throughout all hosts. This saves you a lot of frustration during troubleshooting. Being able to depend on your vMotion network to migrate the virtual machines safely and correctly is worth its weight in gold. Thanks for the great article and I am glad you mentioned the word to the wise at the end. What about Multi-Nic vMotion with IP Hash configured at the vswitch level ? Would it speed the things up to create multiple VMkernel port on this config ? I would like you to direct you to the prequel article: Designing your vMotion network in which it describes why you can’t use IP-Hash. Would it make sense to use the same VMkernels for both iSCSI and vMotion ? (please note that this is on Essentials+ edition so very few migrations and manual only). I could also create some additionals VMkernels but on same vmnics. How would you deal with that case ?